Throughout the drawn-out Rob Ford crack-smoking saga, one thing has been made abundantly clear: Rob Ford has very poor judgment. As a Mayor, as a person, and as a representative for the City of Toronto, Rob Ford’s judgment has continually proven lacking. This, above all else, is the reason that he should resign immediately. As I wrote in previous articles about this subject, it’s not his now-confirmed crack use that’s even the problem. Even though crack cocaine is a highly addictive substance that should not be clouding the mind of any elected official, occasional crack use (as odd as that phrase may sound) isn’t necessarily something that should trigger an automatic resignation. However, exercising terrible judgment in the consumption of crack brings a world of other problems with it, not the least of which is criminal association. Rob Ford’s friendship with known criminal Sandro Lisi is well-documented, and the recently-released (though heavily redacted) ITO from Lisi’s arrest warrant details their relationship, including exchanges of manila envelopes on multiple occasions. More disturbing than his association with Lisi is Ford’s use of city resources/employees during his attempts to retrieve the video, such as “Director of Logistics” David Price, who earns $130,000 per year on the City’s dime. Most disturbing of all is the fact that Rob Ford was foolish enough to put himself in that position in the first place, and in doing so, make himself vulnerable to blackmail and extortion. No elected official can ever afford to make themselves vulnerable to exploitation, as Rob Ford has. We learned from Mohammed Farah that Rob Ford’s people weren’t the only ones interested in the crack video – he claimed that “organized crime” offered his clients “a suitcase full of money” for the video, ostensibly to exert control over Rob Ford and push him to provide preferential treatment to their more-legitimate businesses when doling out city contracts. From construction to maintenance to security, and a wide range of other industries, doing work for the City of Toronto is huge business, and one can see how having an embarrassing video of the Mayor of Toronto might be helpful to a firm wanting a better contract in one or more of these areas. Ford foolishly put himself in a position where he could be drawn under the influence of those who might seek to pervert the assignment of contracts, and we cannot help but question all the work he’s done since the video was filmed. Was he pressured to provide GFL with the privatized garbage contracts west of Yonge St that he has so often bragged about? Are there interests in Scarborough that will directly benefit from the subway expansion he has made himself a champion for (and can’t seem to talk about anything else)? Did the construction firm that did the road work outside of Deco Labels receive any other large construction contracts, before or after they did road work in front of Ford’s family business? This is the very reason why elected officials are expected to maintain some balance of normalcy in their lives – not because we want to intrude on what they do in private, but because we cannot afford to have our elected officials beholden to criminal interests. Worse still, Ford’s lies and denials over the past six months have only served to lengthen the amount of time that he could be under the control over these interests, and stretched out the period of blackmail and extortion by many unnecessary months. Ford now says that he has “nothing left to hide,” but how can we believe a man who has lied to us repeatedly, and has shown his judgment to be so poor as to be inexcusable? This isn’t something that rehab can fix, and no matter how sorry he claims to be after the fact, Ford still has corrupted the entire democratic process. There’s no treatment program for crime (unless you think that’s what prison is for) and once an elected official does something so unconscionable, we cannot afford to give them another chance to do it again. This isn’t about Rob Ford The Man – this is about Rob Ford The Mayor. Whatever substance abuse problems he has, we can show him all the compassion and understanding in the world, and hope that he overcomes his challenges. But as Mayor, he has so deeply betrayed the public trust by making himself vulnerable to blackmail and extortion – and then lying about it afterwards for many months – that we can never give him the chance to betray our trust again. Rob Ford must resign – there is no other option at this point. 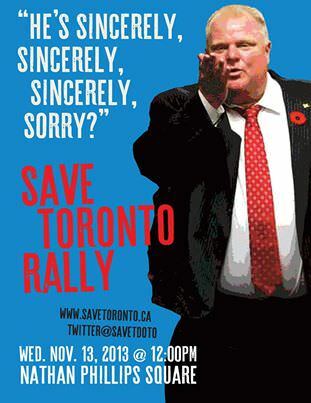 Join SaveToronto.ca on November 13 at 12pm at Nathan Phillips Square to raise our voices in support of our city, and tell Rob Ford that he needs to step down, immediately and permanently.